Kill Command is a 2016 British science fiction action thriller film written and directed by Steven Gomez starring Vanessa Kirby and Thure Lindhardt. 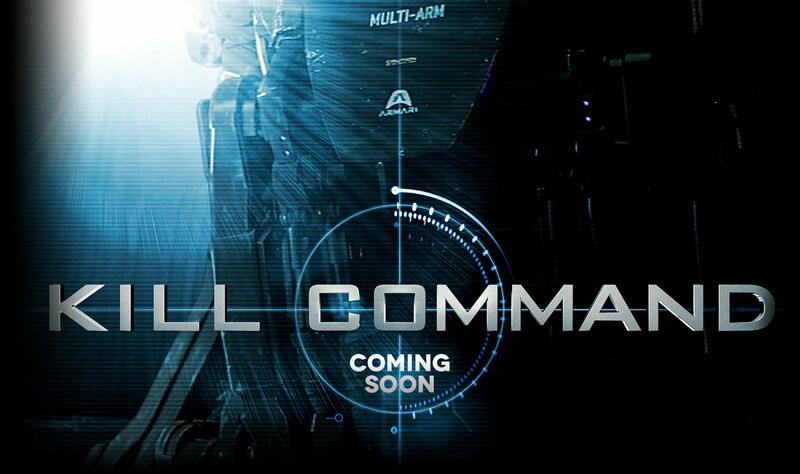 The story focuses on a group of soldiers attempting to survive after a training mission against warfare A.I. goes wrong. "In a technologically advanced near future, Katherine Mills (Vanessa Kirby) a cyborg working for megacorporation, Harbinger, discovers a reprogramming anomaly regarding a warfare A.I. system located at Harbinger I Training Facility, an undisclosed military training island. She meets with Captain Damien Bukes (Thure Lindhardt) and his team consisting of Drifter (David Ajala), Robinson (Bentley Kalu), Cutbill (Tom McKay), Goodwin (Mike Noble), Hackett (Kelly Gough) and Loftus (Osi Okerafor), all of whom have been assigned to a two-day training mission at Harbinger I. After arriving the team notices global communications have been disabled limiting them to local access only. They discover autonomously operating surveillance drones monitoring them. The team begins their mission of eliminating A.I. threats. The first encounter proves easy for the team as they eliminated A.I. drones from a vantage point. During the battle Mills discovers an advance S.A.R. (Study Analyze Reprogram) unit, 003, but is unable to access it. That night Drifter and Mills discuss their pasts and Bukes' disdain for her. Later that night, Loftus is killed by the S.A.R. unit. The next day they discover Loftus's body at the location of the first encounter. The drones take the team's original vantage point and kills Hackett. They discover the A.I. is adapting and learning from them. Bukes flanks two drones and the drones disperse. Later the S.A.R. unit captures Cutbill and has him shot and killed by another drone. The drones attack the group again Bukes and Mills are separated from Drifter, Robinson and Goodwin. That night the S.A.R. unit discovers Bukes and an unconscious Mills. The S.A.R. unit ""connects"" with Mills and leaves. The next day they meet and attempt to exit the training area. At the barrier the team is attacked by smoke and gunfire. Drifter is shot and pinned down by the S.A.R. unit. Bukes kills Drifter as a coup de grace before the S.A.R. unit is able to. The team manages to get into the barrier complex and discovers the A.I. had killed all employees. Mills activates another S.A.R. unit to learn that S.A.R-003 reprogrammed the A.I. to use lethal force in order to improve soldier motivation and has ordered the soldiers to Harbinger I on its own. S.A.R-003 and other units break through the barrier door as the remaining team escapes through the back. Mills discovers an EMP device which can be used to stop the original S.A.R. unit but could also kill or wipe her mind clean. Bukes, Mills, Robinson and Goodwin place explosives to prepared for a siege. The following day A.I. drones attack and kill Robinson. Goodwin drops the EMP detonator after being saved by Bukes. Mills retrieves it. As S.A.R-003 approaches, Mills denotes the EMP incapacitating herself and S.A.R-003. The S.A.R. unit reawakens and attacks Bukes and Mills. Mills manages to control a drone gun in the building then shoots and destroys the S.A.R. unit, S.A.R. however manages to upload its program into Mills before shutting down. Mills passes out. Later a ship arrives to rescue Goodwin, Bukes and Mills. Mills reawakens with S.A.R-003's mission protocol."